In Real Life, Tai Chi is moving like water. In Avatar: The Last Airbender, waterbending IS moving water. One can achieve amazing things by properly training the body. But in fiction, it's possible to gain even greater ability through daily meditation and training the mind. The end result being, the characters condition themselves to exceed their human limitations until they unlock their true potential. As such, it's a staple of martial arts related media, Anime, and Fighting Games. It often overlaps with Martial Arts and Crafts and frequently includes the use of Dangerous Forbidden Techniques. Distinct from Kung-Fu Wizard, wherein someone has martial arts and magic, but they're separate abilities. Contrast Mind over Matter, wherein someone can do amazing things with the brain, but not necessarily the body. Ki Manipulation is a subtrope of this. Dragons Up the Yin Yang are a common visual motif. Not to be confused with Full-Contact Magic, which is magic first, fighting second. Compare Charles Atlas Superpower, where training, usually in the Far East, can make you better than any human in normal reality at plausibly mundane feats, and Ki Manipulation for less mundane ones. See also Fantastic Fighting Style. A controversial way to counteract Linear Warriors, Quadratic Wizards. Black Clover revolves around the use of mana to perform magic and spells as a means of offense and defense. However, most mages in the series are an example of the Squishy Wizard, and most do not have impressive physical traits, making them weak against straightforward physical strikes like punches and kicks. Likewise, most mages do not know how to handle themselves in battle if their magic is neutralized in some way. Yami, one of the captains of the Magic Knight squads, possesses the highest physical stats out of all of the captains. This gives him an edge in most combat situations, since not only is he able to dish out physical damage really well, but he can take it too. Dragon Ball: Thanks to the wuxia influences on the series, the story jumps into ki moves very early on with the introduction of the Kamehameha. More uses include flying, cloning yourself, reading minds, teleportation, and endless over examples. For quite a long time however they are used primarily as special moves due to the amount of ki required to use them, but at about the time the Dragon Ball Z split occurs, they start becoming more common in battle. In the early series, a character knowing how to use their ki, such as Tao Pai-Pai and Tenshinhan, is a clear indicator that they are someone to be taken seriously, and thus there's a clear divide between them and the more generic fighters and wrestlers who tend to be knocked out early in the Tenkaichi Budokai by the ki-using characters. A common misconception is that there's a line between martial arts and ki control. In actuality, controlling one's ki is important to several real-life martial arts disciplines, therefore the supernatural part isn't the ki itself, but rather how it's being used (a classic facet of wuxia). One of the best demonstrations of this was when Gohan taught Videl how to fly: while Videl was highly skeptical at first, she was able to learn to harness her own ki relatively quickly because of her own martial arts training. Ranma ½: Hard training will not only let you do Ki Manipulation, but give you Super Strength, at the very least specific forms of Super Speed, Super Toughness if not outright Nigh-Invulnerability, massively amplify your recovery abilities and let you use even the most unlikely things as lethal implements of destruction. One of the many ways chakra can be used is to increase a being's already considerable physical abilities like the chakra gates or the Akimichi clan's body expansion techniques. Jyuuken (Gentle Fist), a martial art in which lightly tapping an opponent allows the user to insert chakra into them that damages their internal organs and disrupts their own chakra flow. Since this requires hitting Pressure Points with incredible precision and there's slight variation in the pressure points from one person to the next, this martial art requires X-Ray Vision to perform and thus is exclusive to the Hyuuga clan. Toad Kumite is a martial art that utilizes Sage Mode's increased sensory and physical prowess, as well as its ability to control the nature energy around the user (as demonstrated when Naruto punched one of Pain's bodies despite not having physically connected, by using nature energy as an extension of himself). Saint Seiya. Train hard, and you too can reverse a waterfall simply by kicking it, 'cuz screw physics completely. Ku Fei of Mahou Sensei Negima! is capable of killing demons barehanded. Not to mention Negi himself, who boosts his Kung Fu powers with magic. Mobile Fighter G Gundam's elite martial artists Domon Kasshu and Master Asia can catch bullets and destroy Gundam size robots! And their own Gundams are able to receive certain powerups based entirely on the strength of their awesomeness. Magical Girl Lyrical Nanoha Vivid introduced the "Strike Arts", a magic-augmented close-combat martial arts form. Later, a character appears with knowledge of the "Kaiser Arts", basically a stronger form from the Ancient Belkan era. Belkan magic in general is essentially weapon-using magical martial arts that started by augmenting the user's strength, speed and defense, later moving on to elemental energy. The focus on physical enhancement distinguishes Belkan magic from the Mid-Childan style of Full-Contact Magic. YuYu Hakusho explained that normal humans could never hope to match up with the tougher demons unless they learn to channel their spirit energy. Physical strength has its limitations, but spirit energy has none. That said, the strongest humans are leagues below the strongest demons in power. In JoJo's Bizarre Adventure, the Ripple is an ancient form of martial arts that allows a human with the right potential to generate energy similar to sunlight using precise breath control. The Ripple is especially powerful against beings that cannot withstand sunlight like vampires and the Pillarmen. In Dragons Rioting, Koei Sougetsu a martial art style taught to the main character by his father that leaves the rest of the cast whose abilities are normally physical in nature in awe... despite he primarily uses it to run away from attractive girls. Giant Robo combines this with an extensive Rule of Cool. Alberto the Shockwave is probably the best example. Rokushiki (Six Powers) in One Piece has Charles Atlas Superpower applications, like Super Toughness and kicks strong enough to create Razor Wind, but the practice also extends to complete body control, Ki Manipulation and Not Quite Flight. Connected to the above is Fishman Jujutsu and Merman Combat, which is much more focused on manipulating the water as a tangible substance, including to shape and form it. Then we have Hasshoken, exclusive to the Chinjao Family/Happo Navy. This martial arts allows the user to generate and manipulate vibrations to generate shockwaves for greater damage. Though they're concentric waves unlike the seismic force of the vibrations of the Gura Gura no Mi. Variable Geo is a 3-part OVA series about an MMA competition for combat waitresses, who can channel ki and elemental powers. As seen throughout this compilation AMV. Street Fighter II: The Animated Movie is exactly what it says. As such, all of the characters moves and signature specials are faithfully represented, from the opening scene , to it's dramatic conclusion. The post-apocalyptic world of Fist of the North Star (and its prequel, Fist of the Blue Sky, set in pre-WW2 China) is the home of literally hundreds of different supernatural martial arts techniques, usually involving the manipulation of chi, either the users own or his opponents. The main one being of course the Hokuto Shinken (North Star Dipper Fist) used by main character Kenshiro, and his step brothers and fellow students Raoh, Toki and Jagi. By manipulating pressure points and chi channels, the Hokuto Shinken can be used both as an incredibly devastating weapon, causing your opponent to explode violently, or as a method of healing. There is also the Nanto Seiken (South Dipper Holy Fist) which is essentially the counterpart to the Hokuto Sinken, and involves using chi and pressure points to cause damage from the outside rather than the inside. Its used by both villains such as Shin and Souther, and heroes such as Rei. On top of these two, there are dozens of minor styles used by other characters. Marvel Comics invokes this with many characters such as Shang-Chi, the Master of Kung-Fu, and every single one of the many scions of the Immortal Weapons.. They all have various chi-based abilities. In American Born Chinese, The Monkey King acquires numerous abilities through the mastery of various kung fu disciplines. G.I. Joe: When Larry Hama is writing, ninja characters are nearly invincible. Storm Shadow can disappear from locked rooms with no windows. The first example was in issue 10, with Snake-Eyes slowing down his heart beat to fake death in order to fool Dr. Venom. In Planetary, Anna Hark recounts how one of her ancestors practiced supernatural martial arts, including such feats as using flame from a candle to create a wall of fire, walking on water, kicking droplets of water so fast that they strike like knives and the "Night's Stars Attack", which causes the target to be consumed by a dragon form made of sparkling stars. It is implied, but never shown, that Anna and her father knew these techniques. Richard Dragon, Lady Shiva and their teacher The O-Sensei all have martial arts skills that extend to healing abilities and slowed aging, Dragon's has "evolved" into functional telekinesis. Savage Skies gives this to the My Little Pony: Friendship Is Magic races. The primary focus is on the Gale King style, as the central character is a pegasus, but there's mention of the unicorn Still Way and the earth pony Mountain Root. The terms have been picked up by various other fics in the fandom. NESMario123's online web series BunchOfPseudoIntellectuals Z Kai Or B.O.P. Kai for short, it depicts many commentators of the Bunch of Pseudo-Intellectuals commentary group fighting with martial arts and in most episodes blasting enemies with Ki, with the most famous example being Episode 3. In The Games We Play, there are four known styles of martial arts that use Aura to empower the practitioner. Jaune picks up the White Tiger Style and runs with it so far he becomes the second coming of the founder in everything short of actually doing so. Spoofed with the Wuxi Finger Hold in the first movie's final battle scene — flexing a single finger causes a massive blast wave that may or may not disintegrate the target. There's also the nerve attack, which causes brief flashes of light when it hits. Kung Fu Panda 2: There's Po catching and throwing back cannonballs (well, explosive fireworks cannonballs, but still...) due to having achieved Inner Peace. Kung Fu Panda 3: Po learns to give chi with some help from Tigress and a secret village of pandas, which not only bathes everything in golden light but can fill biological vessels with life energy. Crouching Tiger, Hidden Dragon involves Wuxia fighting, including running up walls and fighting on reed-thin branches of trees. Hero is a Wuxia film focusing on magical martial arts. Fighters are shown deflecting a Rain of Arrows with swords and dress sleeves, hacking through hundreds of armored soldiers, and jumping off the surface of water to swordfight in midair. Kung Fu Hustle is a Troperiffic Affectionate Parody and Indecisive Deconstruction of all the over the top supernatural martial arts films to ever come out of Hong Kong. For example, there are two Musical Assassins, a woman with a weaponized voice, and a main villain who uses toad style kung. Downplayed in Game of Death as it only applies to the last fight: Jabbar's character has lizard eyes and displays super strength. The Last Dragon is an Affectionate Parody of both this and of Blaxploitation films. The little-seen ChayShan magic system in Elantris. Word of God says it looks like Tai Chi, but gradually getting faster as you go along. The martial art Sinanju in The Destroyer series. It's practically a Charles Atlas Superpower, as noted on that page. The Discworld gives us the Monks of Time, who practice time slicing by moving time out of their surroundings and into themselves. With the addendum of a certain humble sweeper, the only known master of Deja Fu, or "The sensation you have felt this blow before", which allows a level of time mastery beyond even the newly awakened Anthropomorphic Personification of Time itself. Justified in Dark Heavens as the male lead, John Chen, is actually the Chinese God of Martial Arts, Xuan Wu. Coiling Dragon bases its magic system on using the elements and natural forces. People become stronger and develop personal combat abilities by improving their understanding of the mysteries of each type of magic. In Varjak Paw some cats practice a mystical martial art called the Way. Jalal teaches the Way to Varjak in his dreams. Power Rangers Ninja Storm and Power Rangers Jungle Fury both feature organizations that teach Supernatural Martial Arts: students of Ninja Storm's Wind and Thunder Ninja Academies can pull off elemental effects, where the monks of the Order of the Claw in Jungle Fury are trained in the use of the Animal Battle Aura. The same also applied to their Super Sentai counterparts, Ninpuu Sentai Hurricaneger and Juken Sentai Gekiranger, respectively. Into the Badlands' first season finale features monks who use this against Sunny. M K, when cut, also turns into a One-Man Army. Iron Fist features Danny Rand AKA The Immortal Iron Fist performing Kung Fu while demonstrating increases speed and agility... and of course the Iron Fist. Marco Polohas the character of Hundred Eyes doing some kung fu of...questionable plausibility. The in-universe explanation is that he has access to all of the original works of Lao Tzu, the founder of Taoism (including secret ones, that were only accessible at his original monastery). The real explanation is probably that the directors just really like Wuxia movies (and likely knows that their audience does too: so they're putting it in to make all the "boring" history go down easier). The moves are all real, but their power-level is just a smidge too high. Nothing is so far out of the ordinary as to be ridiculous to the uninitiated, but far enough to raise the eyebrows of any dancer or actual martial artist. The series also has Jia Sidao, the Chinese prime minister, know some of these moves. The "Grasshopper" Technique that they both use was indeed a real thing (as was the practice of keeping grasshoppers and getting them to fight by tickling them). However, it did not actually let you defy the laws of physics. It is also not biologically possible to reset a dislocated joint on your own body, which Hundred Eyes does several times. Slightly justified in that Marco Polo is not a completely reliable narrator, and people at the time actually believed that martial artists manipulated the energy of the universe (chi or ki) to do things which people (wrongly) assumed were impossible. This belief is kind of the reason why this trope exists in the first place, so it's presence in the series is not ridiculous. Especially since removing the physics-defying moves would not affect the story's continuity. The Breaker has a secret society of martial artists who are superhumanly strong due to their training to use their ki. Skills seen so far are Ki Manipulation, Flash Step, Megaton Punch, and some martial artists also have a Healing Factor, essentially making it a Wuxia setting in modern day. Turning yourself into a living golem with extendable magic claws? Prismatic Arrangement of Creation. Charcoal March of Spiders: when you absolutely, positively have to punch out everyone on the continent twice in the same instant, accept no substitutes. There's a whole Splat of these guys in the game Mage: The Ascension, the Akashic Brotherhood. They are (mostly) Asiatic monks with a specialty in Mind magic who weave their spells through various meditation techniques and practice a specific type of kung-fu magic called Do ("The Way"), which they claim is the martial art upon which all others are based. In addition to being one of the more mystical werewolf tribes, the Stargazers invented a martial art called Kailindo, which incorporates a werewolf's shapeshifting abilities and bits of wind-magic. The Children of Gaia practice a staff-based martial art called Iskakku. Vampire: The Masquerade: vampires can learn Kibatsumejutsu, "the art of fighting with claw and fang". It was mentioned in the Combat sourcebook, and quickly forgotten, it seems. New World of Darkness: The spiritual successor to the Akashic Brotherhood is the legacy of mages called the "Perfected Adepts." They harness spiritual energy in order to enhance their bodily performance. One of the Sourcebooks also has details of a magical fighting style known as "The Adamant Hand". Shadowrun: Physical Adepts channel magic into their physical abilities rather than cast spells. The Tome of Battle. Some Diamond Mind maneuvers allows you to slow time down by being really focused and good at hitting people with swords. The Desert Wind maneuver group, which creates fire (usually). The Shadow Hand maneuver group, which allows you to turn invisible, teleport, walk through walls, and create illusions by being really focused. The Monk character class from various editions uses magically potent martial arts. Details vary by edition, but 3.5 Monks have a rather eclectic collection of abilities including moving fast, surviving crazy falls, dodging fireballs, immunity to diseases and poisons, resistance to magic, teleportation, turning ethereal, speaking with any creature with a language, killing people with a touch and ceasing to age. Various prestige classes provide alternative specializations and flavor. Death Fist from GURPS: Martial Arts combines martial arts and chi powers then backs up all of that with magic that allows you to alter yourself and opponent. There's also Dragon-Man Kung Fu where you learn to breathe fire. GURPS Lensman. The Adepts of North Polar Jupiter are said to use the martial art "Thuleschlag", which at higher levels allows the user to become invisible and blind or kill an opponent by touching them. Feng Shui's various fu powers allow a martial artist to do a variety of effects, like setting someone ablaze with your fists, creating a blade out of pure darkness, stopping bullets, and making spectacular flying leaps. Weapons Of The Gods is all about this trope. Martial arts techniques at the low end let you do things like run up walls, freeze people with a punch, or turn nigh-invisible. At the high end, they let you fly for miles, wipe out a horde of Mooks with one attack, or kill someone nine times over. Its Spiritual Sequel, Legends of the Wulin, is similar, but slightly toned-down. Anima: Beyond Fantasy has a whole system for building from scratch any kind of Supernatural Martial Arts technique. The official techniques are a varied bunch; among the weirdest we find a Rose-themed style of fencing and a Kill Sat invoking martial art. Mysticism in RuneQuest is all about supernatural martial arts, usually gained by giving in to temptation while trying to Ascend to a Higher Plane of Existence. (Frankly, a lot of monastic disciples are really there just to advance to the point where the temptations offered are really good.) Some non-mystic religions offer similar powers; notably, in Mongoose Publishing's Second Age books there's a brawler who can literally hit you so hard your parents die. The Jeskai Way, one of the clans of Tarkir in Magic: The Gathering, practices these. 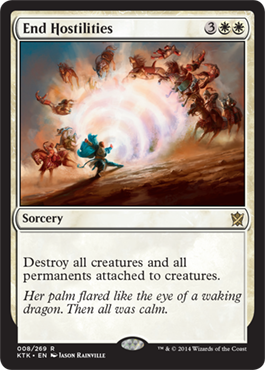 It's telling that the main Wrath effect in "Khans of Tarkir", End Hostilities ◊, represents a particular Jeskai martial arts move that wipes out everything in the area. Dragoneye, from the Emerald City setting for Mutants & Masterminds, was explicitly built as a supernatural martial artist because they wanted a Mystic archetype, but didn't want to fall back on the usual Squishy Wizard setup. The four "genie" styles (Djinni, Efreeti, Marid, and Shaitan) enhance the character's use of a particular element (electricity, fire, cold, and acid, respectively) with the Elemental Fist feat. Illusive Gnome Style draws on the natural affinity gnomes have for illusion magic to enhance their ability to feint in combat. The Mortal Kombat series of video games. Characters can hurl fireballs and even shoot lasers from Ki attacks. In Mortal Kombat: Deadly Alliance, characters can still fight on despite having what looks like a giant World War 1 trench sword sticking out of them from an "impaling" move. Jade Empire, in addition to more conventional martial arts, has Ki-powered styles that involve throwing fire from your hands, bringing down storms of hail, and causing localized earth tremors, among other things. Even one of the "conventional" Martial Styles lets you grow Wolverine-like claws out of your knuckles. And don't forget the martial arts that turn you into various monsters. Street Fighter games let you throw fireballs, or even make your body a fireball. Starting with the Final Fantasy VI, the Final Fantasy franchise makes its Bare Fisted Monks as supernatural as its magic users, often granting them Super Strength, Super Speed, and improbable agility. Sabin Rene Figaro and Duncan Harcourt can punch hundreds of times per second, smash foes with beams of Battle Aura, release fiery clones of themselves, shed their Life Force to heal others, fling Razor Wind with their hands, and split themselves into many copies to pummel an enemy from all directions. And suplex runaway trains. Tifa Lockhart (and probably her master Zangan) can lift and toss Humongous Mecha, and unleash gigantic explosions of Battle Aura with a single punch. And summon dolphins! Zell Dincht can crack open yawning chasms with a punch, turn himself into an energy missile that can go through enemies, somersault-kick enemies high up into the stratosphere, and run around the world in less than five seconds as wind-up for an explosive punch. He can also do the now-famous "lift and toss mountain-sized enemies." Monks in Ivalice can resuscitate fallen comrades with a shout, punch people without coming into physical contact, rend the earth, heal injuries or status effects with their Battle Aura, or kill with a touch. Basch is shown as being capable of punching reality with his Limit Breaks. Makes one wonder how he managed to get captured so easily... Of course Vayne can do the same thing with a similar attack. Fran also has two Limit Breaks but hers cause explosions and a Razor Wind. Snow doesn't even know any martial arts, but he can beat gods to death by kicking and punching them. And this is before he gets his phlebotinum powers. Eight eschews weapons in favor of magically-enhanced martial arts. As Class Zero's resident Kung-Fu Wizard, he can go toe-to-toe with Magitek Armors that tower over him with fisticuffs and magic skills. The King of Fighters features a cast of supernaturally empowered characters, while others, such as the Psycho Soldiers Team, supplement their fighting abilities with Psychic Powers. Advanced V.G. features an entire cast of Ki-enhanced waitresses, who're competing in an MMA tournament. It was later adapted into the 3-part OVA. Phantom Dust has the ki school as one of its five skill sets. In addition to basic punches and kicks strong enough to put holes in solid conrete walls, it allows the player to jump thirty feet in the air, dash at lightning speeds, fire ki blasts, enhance their strength and walking speed, brush aside speeding fireballs and laser blasts, regenerate health, and apparently punch the memories out of their target, making them forget their skills. Ganondorf in Super Smash Bros. Same goes for Captain Falcon, what with his flaming punches, kicks and bearhugs. And Lucario, with assorted Ki Manipulation. In the online game, Urban Rivals, the Fang Pi Clang is made up of many different martial artists. Power Fist techniques in Disgaea allows for such various techniques as teleportation, the Megaton Punch, and, at maximum levels, punching a hole in the universe and making a black hole. In a story sense, something like this seems to apply to anyone who fights in this series. As a general rule, demons tend to be stronger than humans but there are some humans, like Almaz who can fight on par with demons. Taking the Unarmed skill tree in Dungeons Of Dredmor rewards you with bonuses to Magic Power and Aethereal Damage once you reach the highest levels. Bloody Roar: In addition to the standard ki attacks and elemental powers, each member of the cast is capable of transforming into werebeasts, which greatly enhances their natural fighting abilities and is the series trademark. Starting in Diablo II, the Assassin is a member of clan that were originally sorcerers before they dedicated themselves to kill rogue sorcerers. As such they decided to forsake magic and instead focus on using technology and supernatural martial arts including the ability to attack enemies with their minds, meld with shadows to make themselves resistant to damage, kick fire at foes and run faster than the eye can see to kick someone. The Barbarian and Amazon may also count as some of their skills mix supernatural powers with combat expertise. The sequel Diablo III, the Monk takes over here with the Demon Hunter following behind. Magma Dragoon in Mega Man X4 is technically using technology rather than magic, but as a walking Shout-Out to Street Fighter, he has this aesthetic (firing literal fireballs out of his hands and setting his punches and kicks on fire). The Eternal Soldier from Nexus Clash is, depending on the player, either a wielder of Charles Atlas Superpowers or this. Or both. Super Daryl Deluxe: Daryl's unique fighting style (learned from a self-help book, "Interacting with Others") includes throwing out fire with punches and kicks, but that's on the mundane side of what he learns to do. Shooting rubber ducks with a bow and arrow or spontaneously summoning whack-a-moles is where he crosses over into I Know Kung-Faux. El Goonish Shive: Anime-Style Martial Arts. Later revealed to be the characters unconsciously using their latent magic abilities to enhance their strength (and make themselves glow). Seeing how it's set in Exalted's Creation, Keychain of Creation naturally has this. There are plenty of more action-packed scenes over the course of the comic, but this filler strip probably sums it up best in only three panels. Might be the case in Distillum, with the martial art Sidney teaches Rob and Kavitha ("it's what tai-chi is derived from"). Or possibly it's more of a way to discipline their bodies and minds. Kill Six Billion Demons: Various forms are common across the multiverse; Pankrash Circle Fighting has been mentioned as being strong enough to allow a beetle to fell a lion, and White Chain often uses 49 Empty Palms style. Angels in general are acknowledged as the greatest martial artists; they have little to do in their infinite lives but practice and use them. Chaka and Bladedancer both are all over this trope in the Whateley Universe. Chaka can see how ki moves, so she can pull a Taskmaster just by watching you use your ki for an attack. In one of the first Whateley stories, she learned a secret paralyzing nerve attack just by watching a mutant ninja attempt it on her. As indicated in the title Shadowrun Corporate Sins takes place in the Shadowrun universe. One of the PCs, Cromwell is a physical adept. Avatar: The Last Airbender and The Legend of Korra are something between this and Full-Contact Magic, as bending is basically regular, real-world martial arts moves used by people who can cause movement of a certain element to utilize the element more efficiently. 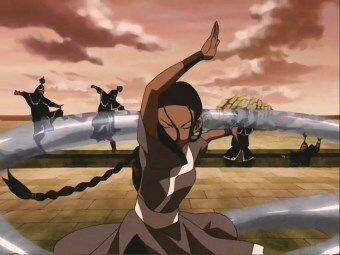 All four bending styles are based off of real-world Chinese martial arts; Waterbending is Tai Chi, Airbending Ba Gua, Firebending Northern Shaolin Kung Fu, and Earthbending Hung Gar. Also as with real-world martial arts, they evolve and change over long periods of time, with new schools spinning off of the ancient traditions. Katara: It's not magic, it's waterbending. Toph's Earthbending style is actually unique from the other Earthbenders, and is based on Southern Praying Mantis Kung Fu. Which, incidentally, was created by a blind woman. In another common feature with martial arts, many of the bending styles are inspired by natural phenomena and the movements of creatures. Waterbenders learned it from the tides, airbenders from flying bison, earthbenders from badgermoles, and firebenders from dragons. While the idea that bending itself was learned by observing these creatures was later Retconned (bending was shown in The Legend of Korra to be granted by lion turtles before every spirit departed the world when the Spirit World and human world were cut off from each other), the idea that styles of bending were derived from watching different creatures or phenomena never changed. Kim Possible's Ron Stoppable and his Mystical Monkey Powers. Woo Foo from Yin Yang Yo! April O'Neil from Teenage Mutant Ninja Turtles (2012) possesses psychic abilities due to the traces of mutated DNA in her body. With her ninjitsu training by Master Splinter and mental exercises by Professor Honeycut, April has learned how to use both in combat, usually using her Combat Hand Fan as a remote-controlled edge weapon. The Society of Righteous and Harmonious Fists (you might know them better as the guys behind the Boxer Rebellion ) thought they had this going for them. The Boxers believed that through training, diet, prayer, and of course martial arts, they could accomplish amazing feats including flight and becoming impervious to knives, bullets, and cannon fire. They also famously claimed that millions of "spirit soldiers" would descend from the heavens to assist them in driving all foreign influence out of China. Needless to say, things didn't turn out like they hoped. Also frequently averted with various youtube videos showing ostensible masters who claim to have harnessed the secrets of whatever insistent terminology they're trying to milk today, whether it's chi , no-touch martial arts secrets or other fluff .